The first and most important task is to take good care of your wife. Make sure she has food — and time — to eat, that she is drinking enough and taking her vitamins and pain controlling medications. Arrange for her to nap during the day; night duty can quickly wear her out. Ward off the visitors — honestly tell them that you both need rest. The home chores (cooking, cleaning, laundry, grocery shopping) that your wife used to handle will fall in your lap, because she is busy taking care of the baby. Organise relatives and friends so they can help you in a meaningful way: drop off the groceries, cook dinners, load the dishwasher. 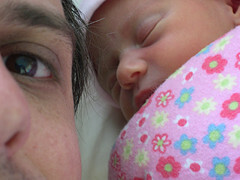 Help your wife with changing and comforting the baby, dads usually have a calming effect on the little ones. If your wife is nursing, she needs to have your full moral support. Avoid bottles during the first two weeks of baby’s life, so the mom’s milk supply can be established. Praise her at every opportunity for her efforts to nurse. Your role as a cheerleader is of utmost importance. Your calm and reassuring demeanor will mean more to your wife than anything else.